Fire Fighters from American Township were fighting a vehicle engulfed by flames outside of The Center For Autism & Dyslexia Lima Center at 2280 Baton Rouge road early Tuesday morning in Lima. LIMA — Students at the Center for Autism and Dyslexia school experienced some excitement at the start of the school day when a Mercury Grand Marquis caught fire in the parking lot, causing damage to the high school/middle school building located at 2280 Baton Rouge Ave., Lima. Staff members evacuated students in the high school/middle school building to the elementary school building, which is across the street on Baton Rouge at 2301 Baton Rouge Ave., Lima. “The kids were evacuated. The school did an awesome job evacuating, along with the help of local law enforcement,” said American Township Fire Chief Tom Hadding. Chief Hadding was very impressed with the evacuation plan as well as the staff and students at the center. “The parents for these kids should be very proud of the staff. They didn’t play any games, they got everyone out of both buildings and did an awesome job,” said Chief Hadding. Firefighters received the call at 9 a.m.
“On our arrival, we had a fully engulfed car and it penetrated to the outside of the structure. The only damage inside the structure was smoke, no fire damage. 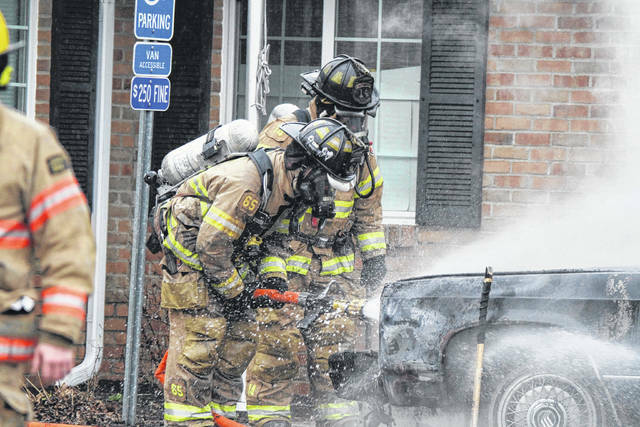 At this time, it’s just a car fire with exposure to a structure,” said Hadding. According to Hadding, the car is a total loss, with damage to the structure at approximately $2,500. “It looks like a window might have to be replaced,” said Hadding. Firefighters were back in service at 9:38 a.m.